Local Peach Stand in Fort Mill, South Carolina - Model Me! I went out for a hike this morning to stretch my legs and try out my new Canon EOS M5 Camera. This is their new all digital system and so far I like it, although I've not had any sunshine outdoors to really give it a fair try. Today I ran across our local peach stand. The recent unexpected freeze killed many of the trees, so I'm not sure we'll have many to sell this summer. This is one of those buildings that just screams "Model Me!" Click on the photos to get the details. 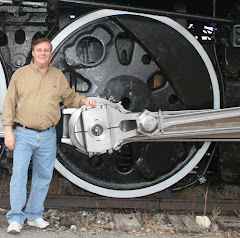 The Model Railroader's Notebook is EXPANDING! No, I'm not expanding. I'm expandED. Larger than life! The Model Railroader's Notebook dates back to January of 1989 when I started collecting my experiments and failures in an on line note file. Very few if any model railroaders were on the web at that time. Shortly after I started the website. About 10 years ago I started the blog to better track what I was doing and to make the entries simple. Now with over 1,200 readers I've decided to go back into the model railroad business. Yes, I did swear I'd never do that again. Mostly because it takes a lot of time away from the hobby. But after looking at my assets, my on line sales expertise (from Capital Ceramics and Paint-a-Potamus) and the ever present dollars growth in the hobby, I'm electing to come back in. Our first venture will be in publishing. For years I've been answering questions on the Heart Of Georgia layout, called the Better Beginner's Layout or just the "Hog." I've finally put it to type and have almost finished the book. I plan to release it in July. I still design train layouts, and in fact have designed over 100 of them, with many of them having been built. Look for more good stuff coming in this arena. My photo lab and lights are on the way! There are several other things up my sleeve, so stay tuned and get your friends on the blog! At the recent train show I was able to complete my list of necessary kits, mostly for tanks, plumbing and piping. Mostly I was looking for tanks for powered chemicals, or silos with hatches underneath. I also need liquid tanks and piping. These should do nicely! I bought two tank cars that I'll need and to glue applicators while I wait on my stuff to come from Utah. Walther's Cornerstone Kit #933-3025 Northern Light and Power Substation - use whole kit for power systems. Up front model so will be highly detailed. Revel Kit #2016 Concrete Mixing Plant - used tanks and concrete base. I had a chance this morning to sneak up to the chemical plant and take photos. This is Sunday so it should be asleep with fewer people running around. Still, I stayed in my car and kept moving. The photos aren't the best because of the morning sun and my driving with the camera out the window, but they are for detail purposes only. I'll post the good ones here. Check this crazy building out. I've been by here a million times and have never noticed it. Its built out of sharp rocks! Very unique. To weird to put on the model though. I try to stay away from crazy/odd/strange structures because they don't look realistic on a layout, even though they are! And all the people said "Thank the Lord for the telephoto lens!" I love this shot.